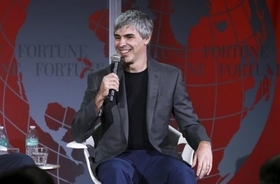 Michigan native Larry Page is referred to as the guy upstairs ('GUS') by Zee.Aero employees, the report said. Google co-founder Larry Page is backing two startups that are working on flying cars, including funding one of them with more than $100 million so far, Bloomberg Businessweek reported Thursday, citing sources. Zee.Aero, into which Page has poured more than $100 million since it started in 2010, conducts test flights of its prototype at an airport hangar in Hollister, California, Bloomberg said. The startup has a manufacturing facility on NASA's research center at the edge of Mountain View, the news agency said. Since last year, Page has also been funding another startup, Kitty Hawk, that is working on a similar competing model, Bloomberg said. Kitty Hawk, which employs about a dozen engineers and has its headquarters about half a mile away from Zee.Aero, is working on "something that resembles a giant version of a quadcopter drone," the report said. Page, a Michigan native, is referred to as the guy upstairs ('GUS') by Zee.Aero employees. He demanded his involvement in the startup should stay hidden, Bloomberg said. Google, meanwhile, has been a leader in the development of self-driving cars with its prototypes routinely seen driving around Mountain View. Google and Fiat Chrysler recently announced a cooperation deal to produce 100 self-driving hybrid Pacifica prototypes. Page, Zee.Aero and Kitty Hawk could not be reached immediately for a comment.